Coastguards in Scarborough have issued a warning after two men were swept into the sea at the resort. One of them, who was thought to be trying to get his dog out of the water, did not survive. Eyewitnesses say waves had been crashing over the footpath the men were on at the time of the tragedy which happened at high Spring tide. Chris Kiddey reports. The coastguard is warning people to steer clear of seafront paths in rough weather. The coastguard has told ITV News Tyne Tees that before his death, a man was found a quarter of a mile out to sea, forty minutes after police received a report from a member of the public. He had been out walking his dog. It is unclear at the moment whether or not the man had gone into the sea after his dog. 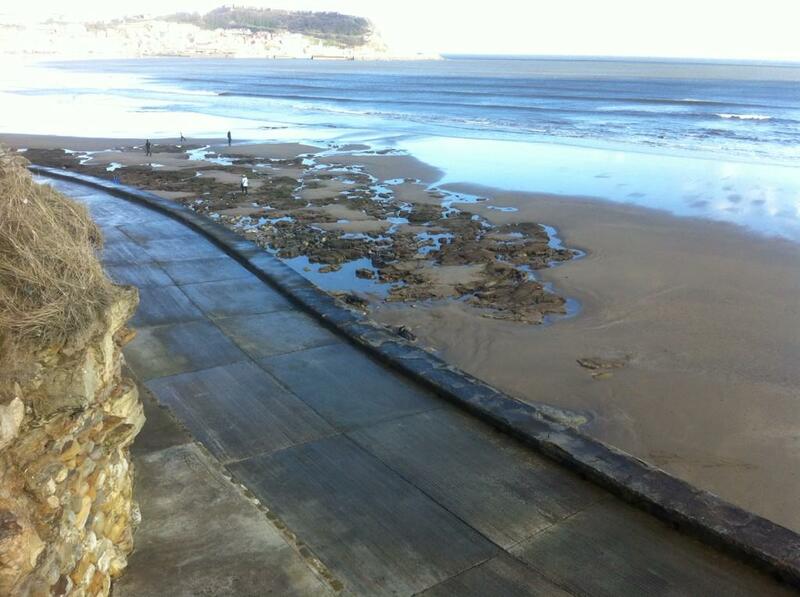 The man was washed into the sea from this coastal path south of the Spa complex. North Yorkshire Police were called to the scene at around 6pm yesterday (Sunday February 22, 2015) after reports of a man being knocked off the sea wall into the water . He was taken to hospital but later died. RNLI Scarborough have paid tribute to a man who died in hospital following a sea rescue operation. The man, in his thirties, had been walking his dog in Scarborough. Our thoughts are with the family and friends of the man who passed away last night in tragic circumstances. Lifeboat crews have recovered two people from South Bay off Scarborough this evening. An emergency call was made just before 6pm said a spokesman. He added that the conditions are very rough with high tides. All the emergency services are involved and the incident is ongoing.